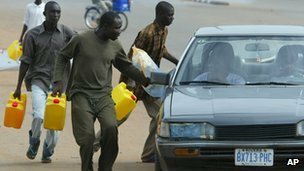 Nigerian people and trade unionists have condemned the government for withdrawing a fuel price subsidy which has led petrol prices to more than double in many areas. Nigerians are angry at the announcement, fearing the price of many other goods will also rise. The main trade unions have called people to prepare for a strike. Years of mismanagement and corruption mean it does not have the capacity to refine oil, turning it into petrol and other fuels. Analysts say many Nigerians regard cheap fuel as the only benefit they get from the nation’s oil wealth. The IMF has long urged Nigeria’s government to remove the subsidy, which costs a reported $8 billion a year. Early in the morning, many petrol stations in Nigerian capital Abuja were closed as the owners were not sure what price they should charge, but they have since opened. Prices have increased from 65 naira ($0.40) per liter to at least 140 naira in filling stations and from 100 naira to at least 200 on the black market, where many Nigerians buy their fuel. There are reports that petrol prices have tripled in some remote areas, while commuters have complained that motorcycle and minibus taxi fares have already doubled or tripled. The government finance team led by respected pair central bank governor Lamido Sanusi and Finance Minister Ngozi Okonjo-Iweala have long argued that removing the subsidy would free up money to invest in other sectors and relieve poverty. In a statement, it urged people not to panic-buy or hoard fuel. “Consumers are assured of adequate supply of quality products at prices that are competitive and non-exploitative,” the statement said. The government recently released a list of the biggest beneficiaries of the subsidy, who include some of Nigeria’s richest people – the owners of fuel-importing firms. Nigeria’s two main labor organizations, the Trades Union Congress and the Nigerian Labor Congress, issued a joint statement condemning the move. “We alert the populace to begin immediate mobilization towards the D-Day for the commencement of strikes, street demonstrations and mass protests across the country,” the statement said. “This promises to be a long-drawn battle; we know it is beginning, but we do not know its end or when it will end. Labor activist John Odah told the BBC’s Network Africa programme that, judging from past experience, he doubted that the government would use the money saved by removing the subsidy to help ordinary people. John Odah said that the subsidy should have been retained until Nigeria’s refineries had been brought up to scratch. “As an oil-producing country, we ought not to be importing fuel in the first place,” he said. John Odah also pointed out that Nigeria does not have many commuter railways, so people have little choice but to use motorcycle and minibus taxis, whose prices are closely linked to the price of petrol. Nigeria is Africa’s biggest oil producer but most of the available 2 million barrels per day are exported in an unrefined state. The country lacks refineries and infrastructure so has to import refined products such as petrol, which is expensive. However, with the price of fuel much cheaper in Nigeria than in neighboring countries, the subsidy led to widespread smuggling. Nigerians are heavy users of fuel, not just for cars but to power generators that many households and businesses use to cope with the country’s erratic electricity supply. The measures just announced could add to the difficulties faced by Nigerian President Goodluck Jonathan, who declared a state of emergency on Saturday in areas hit by Islamist violence.